To use this technique you require 3 inputs. GAV stands for Gann angle and volatility trade technique. c. Previous closing price of the instrument. Price Range = Daily volatility * previous closing price. If the daily volatility is in the percentage form then do not forgot to divide the result by 100. Example 1: Nifty on 18th March 2015 open at 8775, its daily volatility is 0.96 and previous close is 8740. 1X1, 1X2, 2X1, 1X3, 3X1, 1X4, 4X1, 1X8, 8X1, 1X16 and 16X1. degrees, 4X1= 75 degrees, 1X4= 15 degrees, 8X1= 82.5 degrees, 1X8= 7.5 degrees, 1X16= 3.75 degrees, 16X1= 86.25 degrees. corresponding to 1X2= 63.75 degrees, 2X1= 26.25 degrees, 1X1= 45 degrees, 3X1= 18.75 degrees, 1X3= 71.25 degrees, 1X4= 75 degrees, 4X1= 15 degrees, 1X8= 82.5 degrees, 8X1= 7.5 degrees, 16X1= 3.75 degrees, 1X16= 86.25 degrees. How to calculate degree factor? As per the W.D.Gann principle 180 degree’s factor is 1. Hence the degree factor associated with all trend lines in the up move and down move can be calculated by dividing the degree with 180. Example 2: in the Example 1 we have calculated the price range as 86.25 now we will calculate the resistance price range and support price range. If I wish to calculate the 16X1 trend line support and resistance price range then I need to do in the following way. a. 1X2 trend line drawn from the low (i.e. resistance trend line) makes 26.25 degrees with X axis and drawn from high (i.e. support trend line) makes 63.75 degrees. The degree factor for 26.25 degree = 26.25/180=0.14583and degree factor for 63.75 degree = 63.75/180=0.35416. Below table calculates the support and resistance price range of all 11 trend lines. Example 3: In Example2 we have calculated 1X2 trend line support and resistance price range in example 1 I have mentioned the opening price of nifty was 8775. Now we will calculate the 1X2 trend line resistance and support. 1X2 trend line support = 8775-79.7972*0.35416=8746.7390 1X2 trend line resistance = 8775+88.9799* 0.14583= 8787.9759 Below table has the resistance and support calculation of all GAV trend lines. Buy sell decision? If the current price is above 1X4 trend line i.e. 8767.94 in the above table then trade will sell for target of 1X1 trend line i.e. 8797.75 and final target 1X16 trend line i.e. 8820.70. If the current price is below 4X1 trend line i.e. 8782.32 in the above table then trade will buy for target of 1X1 trend line i.e. 8754.58 and final target 1X16 trend line i.e. 8737.83 What the trader will do if all targets are achieved? 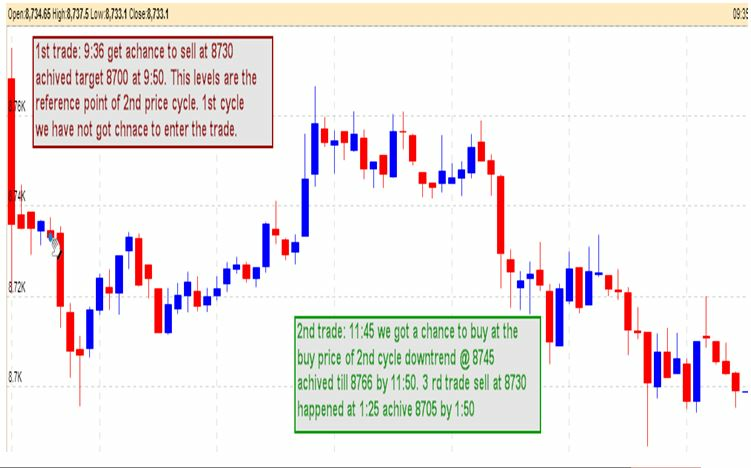 In This case the trader have to derive the price reference for 2nd cycle by changing the opening price with the final target price of the 1X16 or 16X1 trend line . Below table explains the 2nd cycle price points for uptrend and downtrend. The above example is being taken from the 18th March 2015 nifty future data. This is also the proof of the success of this trade.